The makers of SpinPress.com have recently had a great idea! 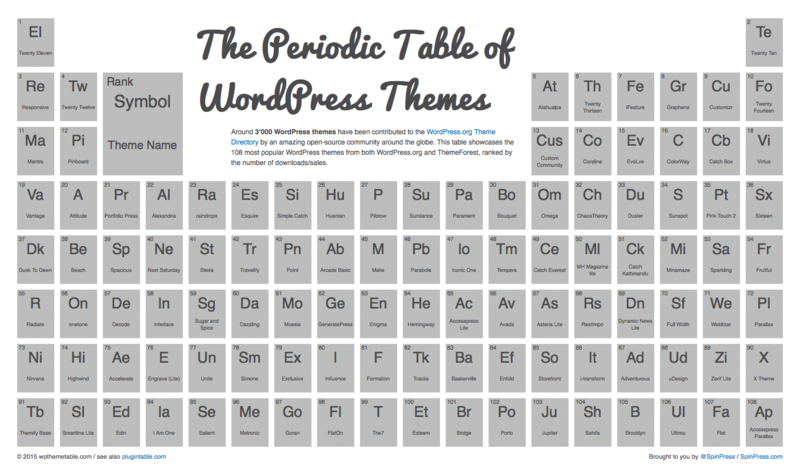 They have released “The Periodic Table of WordPress Themes” which includes the 108 most popular WordPress themes from both WordPress.org and ThemeForest, ranked by the number of downloads/sales. 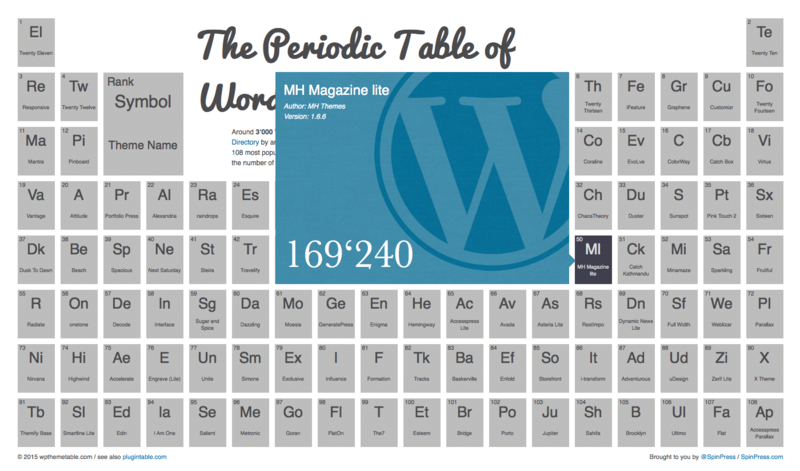 We're very proud that our MH Magazine WordPress theme is part of the periodic table and is ranking as one of the most popular WordPress themes out there! With over 169,000 downloads for the free version of the theme after only two years, the theme currently is ranking as 50th most popular WordPress theme in the WordPress universe. This is absolutely awesome and would not have been possible without the amazing support from our users and customers who are building new fantastic online magazines and news sites every day. Even now after two years the downloads for MH Magazine are still very stable and we're looking forward to crush the 200,000 downloads mark in 2015. We're really happy that you like our magazine theme that much and of course we'll keep going to improve the theme and maintain it as one of the best magazine themes for WordPress on the market. MH Magazine is a magazine, blog and dynamic news WordPress theme which is suitable for online magazines, news websites, professional blogs and other editorial projects. The popular magazine theme has included a fully widgetized front page template and a bunch of flexible and easy to use theme options to customize your website.